They have this huge steel structure with a water fountain. If I did not read it in the newspaper, I would never guess in a million year that the structure is a pinang or betel nut split into two! It looks like an alien ship to me. 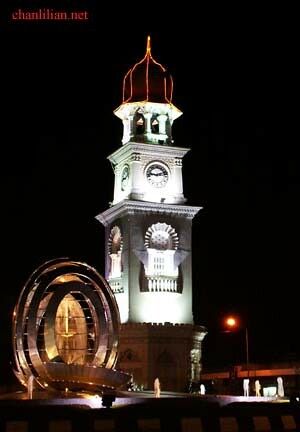 Personally, I think putting a huge, cold, stiff structure next to a century old clock tower does not fit in. If you had travelled to Singapore and HongKong, you will probably see the same clock tower, a legacy of our colonial past. I know I was oohing and aaahing when I saw the identical tower near Kowloon/HongKong Pier. 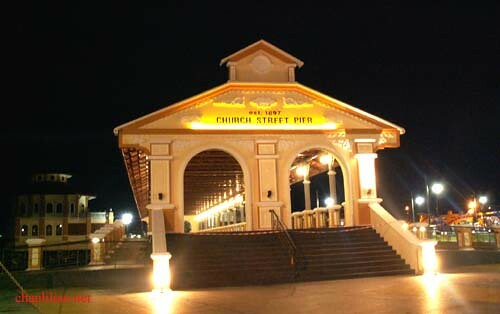 Further down the road, is the newly built Church Street Pier. The place is still out of bound but I squeezed through the barricade for some pics. There is no time for proper camera adjustment. Just point and shoot because I can see a guard coming from the next building to shoo my children and I away. I am glad to see something being done to the Penang ferry. I love ferry rides because it is so calm, peaceful and a blast from the past feel when one is on these slow moving ferries. I used to take the ferry to cross the sea when I was working, having lived in Butterworth (for cheaper room rentals) and working near the pier on the island. Of course, there was a tragedy once when the jetty collapsed due to over-crowding. A lot of people were crushed to death. Weeks after that, I carried nails and garlic in my handbag to keep spirits away from me! Hahaha, there was a lot of rumours going around and I often travel alone at night. Now I can smile over my actions. 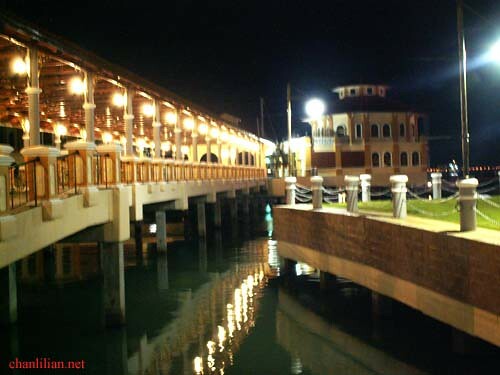 The jetty looks really nice after the renovation. I can imagine couples going there to “pak tor”! the road is Beach Street. I thought the Jetty tragedy happened to the Butterworth side not Penang? DG – ‘They’ still travel on the ferry mah. Hahaha. I used to live in Seberang Jaya. boo – It was empty because it is not open yet. After open, no place for pak tor dy. beautiful shots. I miss riding a ferry. It has been a long time. how often do you take ferry ride?